The progress bar indicates your progress in completing the current test, measured by the number of underlying learning objectives completed. Each test can vary in total length and is also adaptive, which means that the progress will vary from one test to the next, and from one student to the next. Furthermore, some questions address more learning objectives than others, so the progress bar will not always advance evenly. 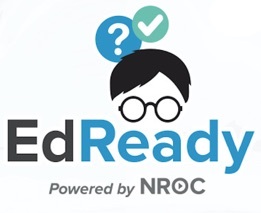 Note that EdReady requires you to complete an initial diagnostic when you first start using the program so that it can help you understand your math and/or English knowledge and give you useful recommendations.